Frankfurt is one of Germany’s warmest cities and has relatively little rainfall compared to the rest of the country. They may sound a little unrealistic if you have just spent the last month here, but it is true! 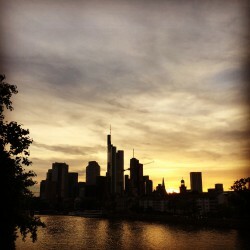 August was actually not a great time to be in Frankfurt, as it was often cold and wet, but normally the city sees average Summer temperatures of 25 degrees between June to August. And you can tell the locals are used to it because of the sheer number of outdoor festivals and events being held in the city, along the river and in many of the small commuter towns. There is something big happening pretty much every weekend and often mid-week as well. Mid-September (i.e. now! ), you’ll see temperatures drop and the rains start more regularly. But even when it gets to Winter, there won’t be more than an occasional snowfall. The worst that you normally expect a bit of frost throughout January when the average temperature is 3.5 degrees. Autumn and Winter are definitely not the highlights of the year. It feels decidedly British but without the wind.